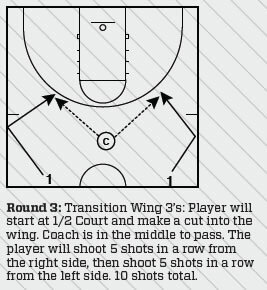 This drill is from an old Weber State Basketball Coaching Newsletter. 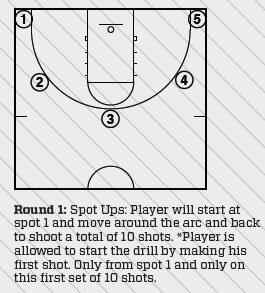 The License is an out of season shooting workout that will really challenge you. 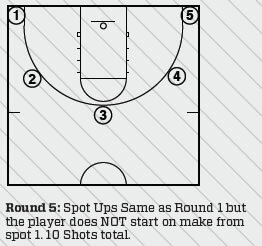 Each shot made is one point. In the diagrams where it shows there is a coach, that can be anyone who is willing to work with you and be your passer. If you don’t have a coach working with you, make sure that you are pushing yourself to run and cut hard by setting a time limit that makes you work at an uncomfortable pace. You can adapt it to fit the level that you play. These standards are for a Divison I men’s program where 2013 unanimous choice NBA Rookie of the Year Damian Lillard played. 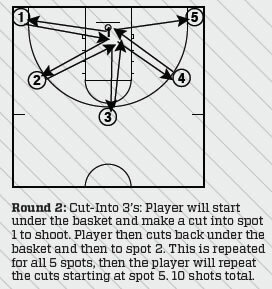 I would start anywhere from 28 to 30 for the goal for high school players and adapt it as you go. You want to make your goals push you, but not so high that they are completely out of reach.